Sign up to take part in your own sponsored horse ride. Pick a date, choose a distance and start raising vital funds in aid of Cancer Research UK. What is Ride for Research? 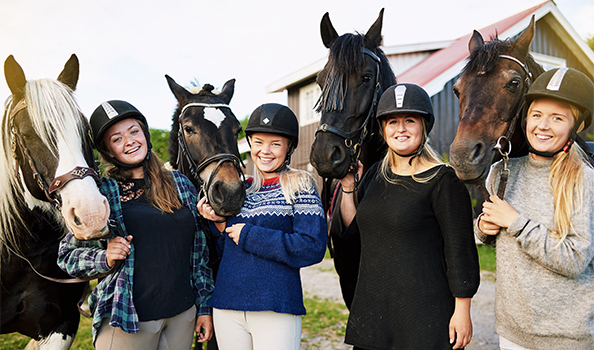 Ride for Research is an opportunity for horse-riders across the country to jump into the saddle and take part in a sponsored horse ride in aid of Cancer Research UK. Either choose to do your own ride at a time which suits you, find your nearest organised ride, or take the reins and host an event in your local area. No matter how you take part, you’ll be joining hundreds of horse enthusiasts across the UK to show that together we are stronger than cancer. Choose to do your own sponsored ride. Pick a date, choose your distance and spread the word to get sponsored. Registration is free, all we ask is that you fundraise as much as possible for life-saving research. Join other like-minded equestrians at an event near you. Find an event then contact the event organiser who'll be waiting to share all the details with you. Take the reins and host an event in your local area. In the 1970s, less than a quarter of people with cancer survived. But over the last 40 years, survival has doubled – today half will survive. Our ambition is to accelerate progress and see three-quarters of people surviving the disease within the next 20 years. We can't do this without your support. The money you raise will help fund life-saving research into the causes, prevention and treatment of cancer. Clare was diagnosed with an aggressive triple negative breast cancer in April 2017. Clare had just bought Frankie, an eight-year-old mare, whose affectionate nuzzling coincidentally led to her finding a lump in her breast. Clare underwent surgery to remove the lump and had six months of chemotherapy. Shortly after, genetic testing showed that her cancer was caused by a faulty copy of the BRCA1 gene which carries an increased risk of breast and ovarian cancer. Thanks in part to Cancer Research UK’s vital role in the discovery of the BRCA1 and BRCA2 gene faults, Clare is now on the path to recovery and is supporting Ride for Research 2019. By registering for this event, you confirm that you have read and agreed to the event rules. Ride for Research is organised independently of Cancer Research UK. Cancer Research UK cannot accept responsibility for any loss, damage or injury arising from participation in or attendance at a Ride for Research event. Furthermore,Cancer Research UK’s public liability insurance does not extend to individual participants. Cancer Research UK strongly advises that all participants have their own Public Liability Insurance and Personal Accident Insurance to take part in the event. Participants are also required to seek permission from land owners before going through privately owned land.